I am Ram Krishna Singh, a university professor. Born, brought up and educated in Varanasi, I am 55, married, with two children--a son, 26 yrs and a daughter, 22 yrs. My main fields of interest consist of English for Specific Purposes, especially for science and technology, and Indian English Writing, especially poetry. In fact, for the last 30 years I have been actively involved in English language skills development at tertiarylevel through EST, and professionally concerned with EST, ELT and ESL teaching problems, techniques,achievements and future possibilities. 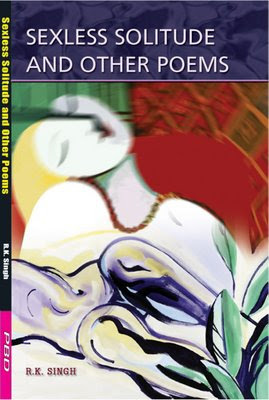 A volume of collected poems of R.K.Singh, an Indian English poet, has recently appeared from Yking Books, Jaipur. 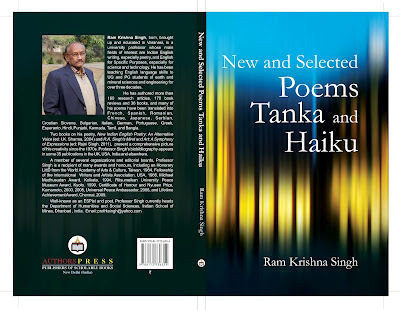 The volume contains all the previously published collections of the poet besides many new poems, haiku and tanka. 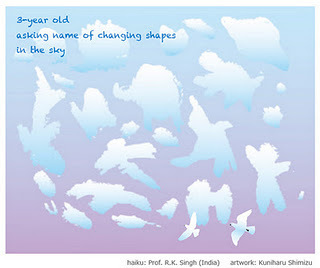 Jaipur 302 006), 2006, ISBN 81-8152-132-3.
herself as a front ranking haiku practitioner in the world today. Angelee Deodhar writes compact poetry with a sense of balance, keeping from the epigrams that pass for haiku which many Indian English poets have been publishing. She recently translated the celebrated Japanese poet, Masaoka Shiki's haiku into English, "If Someone Asks..." (2005). "Rain drops--/On the lips of the leaves/A song stilled." (Jaipur: Book Enclave), 2006, pages 122-123. 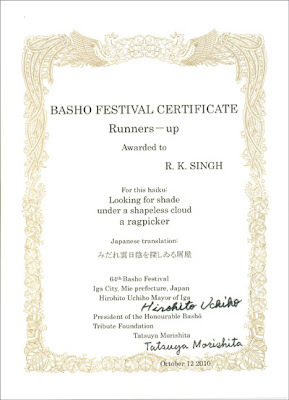 Ram Krishna Singh, is one of the most prolific writers amongst the Indian community writing in English. His familiarity with the short poem has been reflected in his earlier books, Above the Earth’s Green (1997) and Every Stone Drop Pebble a haiku collection, jointly with Catherine Mair and Patricia Prime, (1999). 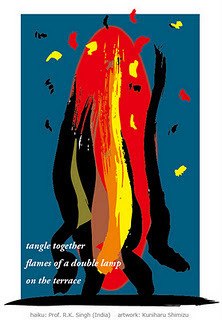 In this collection Singh brings together a total of 445 poems in two sections: the first has 140 Tanka (four to a page) and the second has 305 Haiku (five haiku per page). It would have been better if the book had been arranged with just two haiku per page with more space around each haiku/tanka. Some haiku seem to have a repetitive theme which could easily have been left out. A few Hindi words for example Apsaras should have been explained with a footnote. 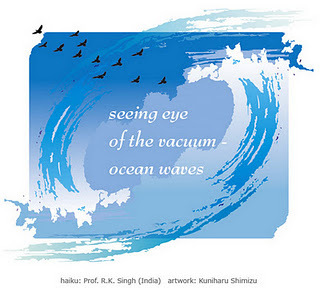 However, Prof. Singh is to be congratulated for his latest collection which well serves his own view, “It is also possible to elevate the quotidian experiences to the level of poetry, using the medium of haiku and tanka, provided one seeks to be visual or sensuous ...". His is a voice which deserves to be heard both at home and abroad. Hon. Secretary, Cinque Ports Poets, England. I would like to express my sinece appreciation for your kind letter and your heartfelt gift of the book, The River Returns, which presents a beautiful new world of poetry. The book impressed me very much and I was deeply moved by your imaginative creativity, which transformed the traditional culture of Japanese Haiku and Tanka into beautiful English poetry. This poetry falls into a different sphere of classification from just pure translation of Haiku and Tanka, and gives us a new genre in the literature of poems. I'm sure your work will be recognized as a leading light in its field. I would like to extend my deepest gratitude for all your kindness and tell you that I await your next publication with great anticipation. "Yohei Sasakawa Receives Gandhi Award"
Today is Buddha Purnima, Lord Buddha's Birth day. *A great sound is inaudible, and a great image is formless,” said Lao Tzu. 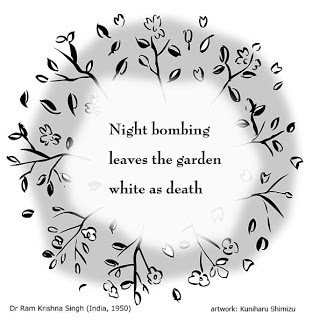 The haiku is composed remembering the Hiroshima tragedy today in 1945.
. Ramadan, Ramadhan, Ramazan . Phailin was a strong cyclone that hit India. 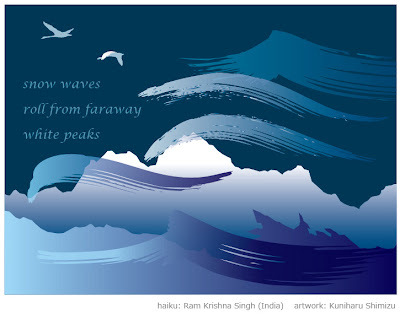 Indian haikuist R.K. Singh poetically shapes human forms into islands in "The River Returns" published by Prakash Book Depot in 2006. Always good to hear from RK, whose romantic spirit gives his haiku a special quality.